Arlington National Cemetery Once the home of Civil War General Robert E. Lee and his wife Mary Custis. Shortly after General Robert E. Lee left his Arlington plantation to fight for the Confederacy in 1861 during the Civil War, the Federal Government confiscated his property and later in 1864 Union Quarter Master Montgomery Meigs recommend that the property be set aside for a National Cemetery. 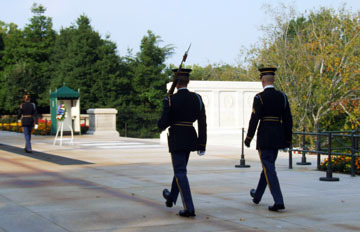 Today the 612 acre Arlington National cemetery is the final resting place of our fallen American's military Heroes.